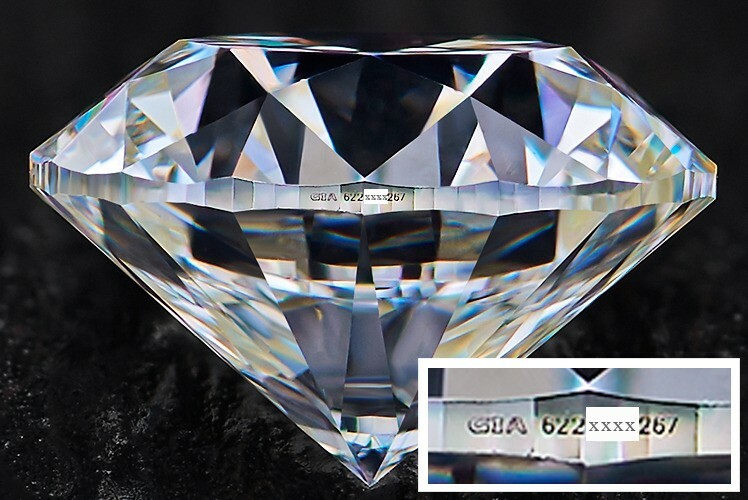 Laser engraving of diamonds — is the use of technology of “cold laser” to write a personal message, usually on the outer perimeter of a diamond, called “girdle”. The laser beam transforms thin layer of a diamond (several atoms) from clear crystal into opaque carbon (graphite). Under a microscope you can see that an engraving is a three-dimensional object. It does not change color or quality of a diamond. The script is permanent, though it may be removed by a professional diamond cutter, in actual fact, without changing weight, shape and size of a diamond. Putting laser engraving is performed on DeBeers certified equipment for diamonds marking. Usually, brand new diamonds, such as DeBeers or Smolensk’s “Krystall”, have already an engraving with the name or logo of the producer. Laser engraving is used on diamonds weighing over 0.25 carat. The kind and shape of a gem-cutting does not matter. Engraving is microscopic; it is not eyeball-readable. A message can be read only through 10 x magnifying glass, so a client can keep it secret or open it only to hostages to fortune. By using laser it is possible to engrave even most sophisticated logos, blazons and symbols, as well as letterings in most stylish fonts. The equipment allows producing very thin lines, delicate shadows and bold letters — whatever you want. Besides engraving on the girdle, it is possible to make engraving on any flat surface of a diamond, such as the table or any of the facets. It’s obvious that the same effect is attainable on any other kind of precious metals and gemstones, whether it is silver or sapphire, gold or ruby, platinum or emerald — it’s just the matter of practicing technology. It seems that nano-marking of jewelry, announced by Ministry of Finance of RF, supposes this particular technology, implementation of which will demand some investment. Though, not so much, as it may seem to be. As the matter of fact, laser became a part of our life long before. Even home masters make a laser graver from an optical disc drive, which can be found in almost any house with a computer. Nothing is impossible to a willing heart! On the next stage it’s important to provide openness and transparency of the unified database of precious metals, gemstones and jewelry both for jewelers and their clients, and for the government. But this is exactly what studied in the concept of JTS Blockchain (Jewelry Tracking Service) in the frame of the project jNet1.